PharmaData delivers solutions to the global pharmaceutical industry to help make more informed decisions in a transformative and competitive landscape. PharmaData solutions empower our clients to achieve their goals with customised world-leading products that help grow generic substitution, create true partnerships with clients, engage sales forces and deliver more patient centric care. As a leading Australian generic manufacturer Alphapharm was looking to innovate how their Sales Force interacted and built professional relationships with Pharmacists. Alphapharm needed an innovative solution to help strengthen client loyalty nationally amongst their partnering pharmacies and sustainably grow generic substitution. In 2012 PharmaData partnered with Alphapharm and launched Crystalyze®. 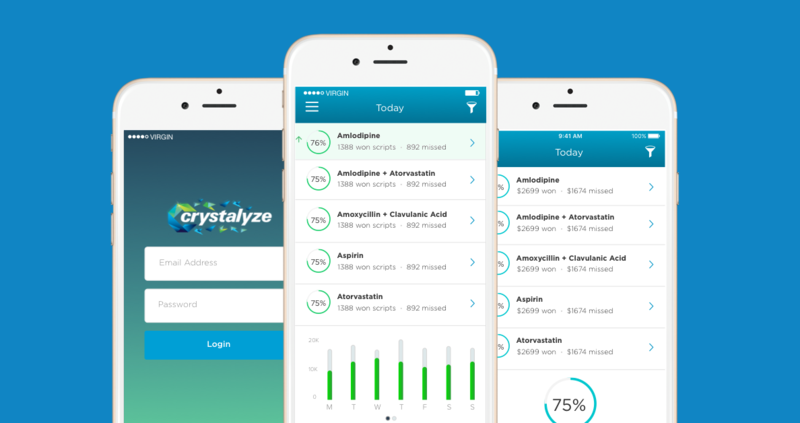 Crystalyze® is a customised PharmaData Generic Intelligence white label product that aimed to create a strong partnership between Alphapharm and Pharmacists through real-time dispensary data insights. Crystalyze® gave Alphapharm’s Sales Force the tools they needed to provide consistent support to their Pharmacists and strengthen client loyalty. Alpharpharms Account Managers were able to truly understand the business opportunities available for each pharmacy in their territory and work with their Pharmacists to sustainably grow their generic substitution. With PharmaData’s Generic Intelligence Alphapharm’s Sales Force achieved true partnerships with their clients and became trusted business advisors while maintaining their position as the number one generic manufacturer in Australia. As a leading global generic manufacturer Mylan wanted to innovate how their Sales Force worked with Pharmacists to grow generic substitution in their stores against tough competition in the European market. Mylan needed an industry leading solution to help engage their Sales Force and create a more meaningful business relationship with Pharmacists. In 2012 PharmaData partnered with Mylan and launched Myris®. 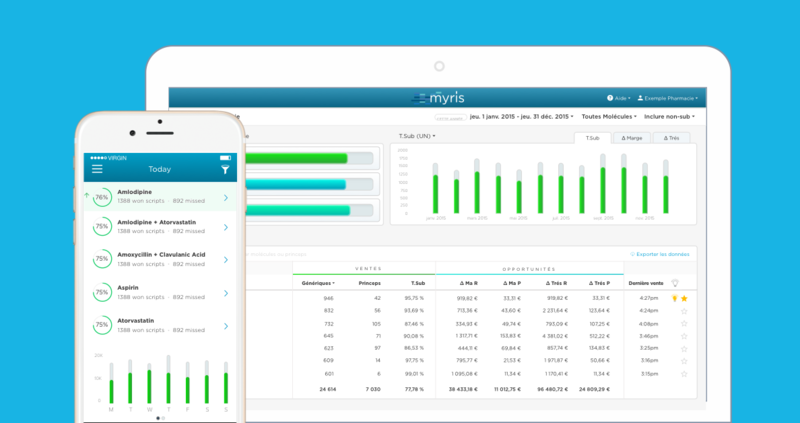 Myris® is a tailored PharmaData Generic Intelligence white label product that aimed to create true partnerships between Mylan’s Sales Force and Pharmacists through real-time dispensary data analytics across France. Myris® empowered Mylan’s Sales Force to strengthen their existing partnerships with Pharmacists and help make complex business decisions simple with never before seen insights. Account Managers were able to identify opportunities in real-time and truly align their strategies with their Pharmacists’ goals to grow generic substitution in their stores. Through these meaningful engagements Pharmacists were able to motivate their team to change substitution behaviour, leading to greater depth in product range and true partnerships with Mylan’s Sales Force. PharmaData’s Generic Intelligence helped Mylan achieved true partnerships with their Pharmacists by aligning their strategies with their Pharmacists’ goals and are now leading the market in generic substitution in France. As a leading pharmacy group expanding their stores across Australia Pharmacy4Less needed to maintain a strong point of difference with their patients. Pharmacy4Less wanted a tailored, innovative solution to help support their Pharmacists and Retail Assistants in the front of shop to improve quality of care and increase better health outcomes. 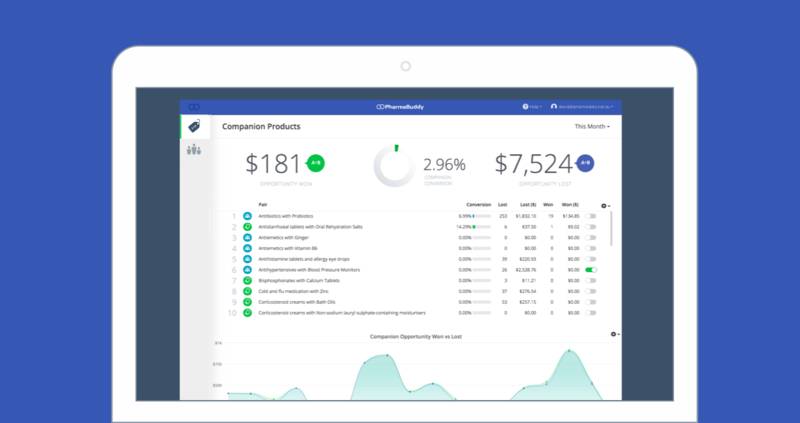 In 2016 PharmaData partnered with Pharmacy4Less and launched PharmaBuddy. PharmaBuddy is a core PharmaData product aimed to assist Group Owners and Retail Managers help their Retail Assistants recommend better health outcomes by becoming more patient centric. PharmaBuddy empowered Group Owners and Retail Managers to set focus products in real-time based on seasonal health trends and monitor how well they were received by patients. Pharmacists were also able to proactively train Retail Assistants who needed help understanding how focus products would benefit patients and provide a better health outcome. By strengthening their customer service skills Retail Assistants were becoming more patient centric and encouraging loyalty from the added value they were providing. PharmaBuddy helped Pharmacy4Less achieve a patient centric approach in their front of shop and strengthen their point of difference with patients by improving quality of care and delivering better health outcomes across their group.